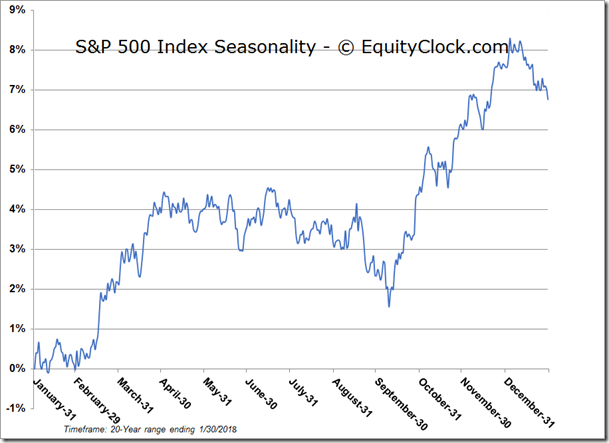 Even with Tuesday’s decline, S&P 500 Index still on track for best January in 20 years. Stocks dipped for a second day as investors questioned the red that suddenly appeared on their screens. The S&P 500 Index dropped just over one percent, amounting to the largest single session decline since August. 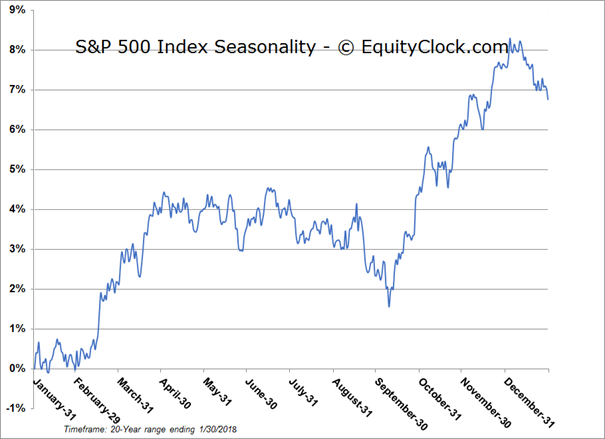 With one trading session left in the month, the large-cap benchmark is still up a healthy 5.6% in January, the best start to the year in 20 years, assuming the benchmark remains around present levels through Wednesday’s session. 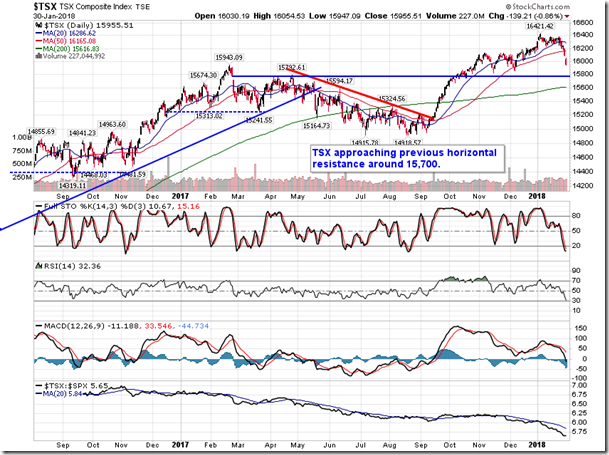 A test of 20 and 50 day moving averages would help to alleviate the parabolic move that had been charted since the passage of tax legislation at the end of last year. 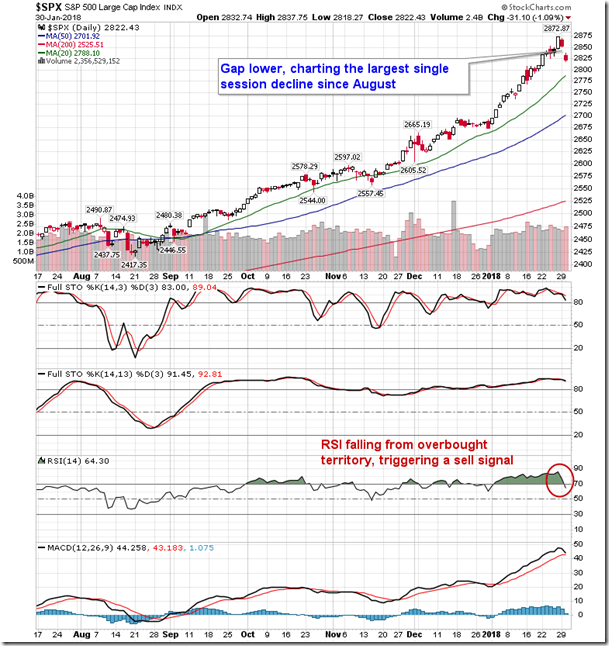 The relentless climb in stocks over the past month has made it very difficult for new investors to enter and retracement would help to entice investors into equity positions to play the ongoing trend of higher-highs and higher-lows. 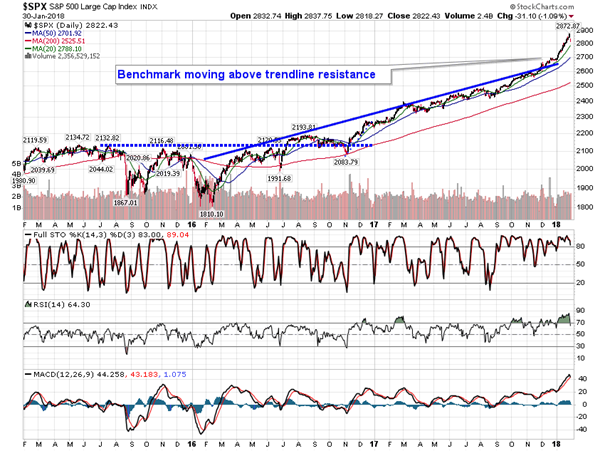 These significant moving average levels now hover around 2788 and 2701, respectively. 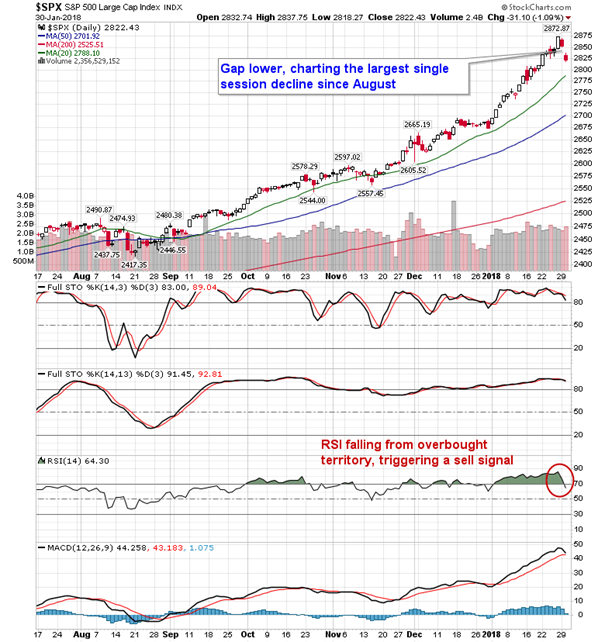 Daily momentum indicators are rolling over, triggering a sell signal with respect to RSI and on the verge of triggering a sell signal with respect to MACD. 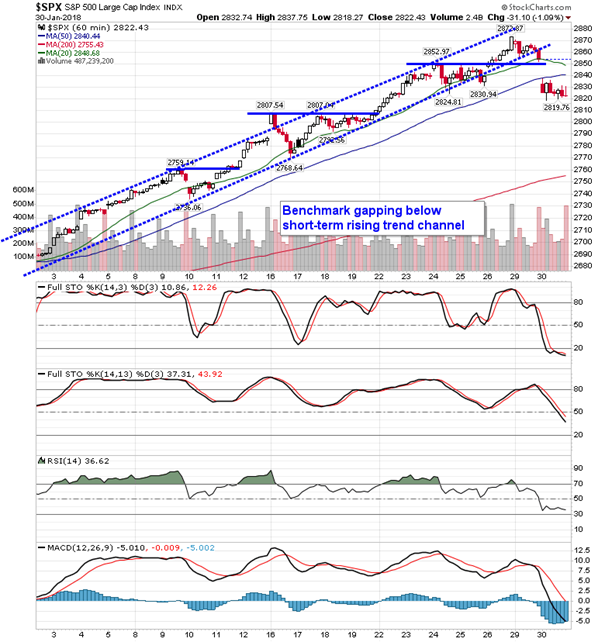 Despite these bearish crossovers, these momentum indicators still appear very bullish, suggesting that this short-term downdraft is merely a counter move in a longer-term trend higher. 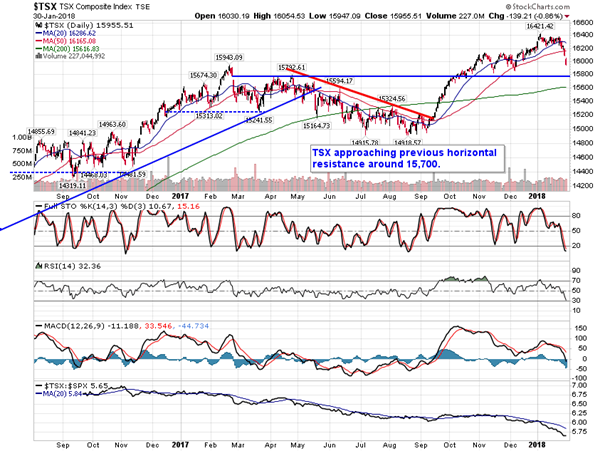 The hourly chart shows the short-term damage that was realized with Tuesdays move. 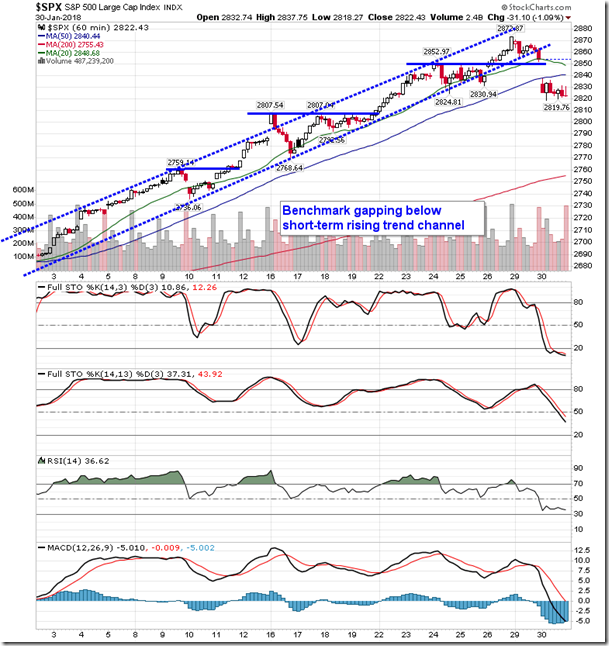 The steep rising trend channel was broken and gap resistance between 2840 and 2850 has been charted. 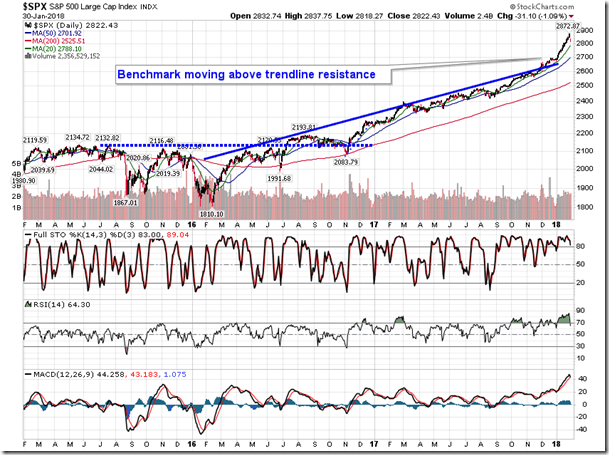 It is possible that we see a gap fill before a check-back to major daily moving averages is realized. 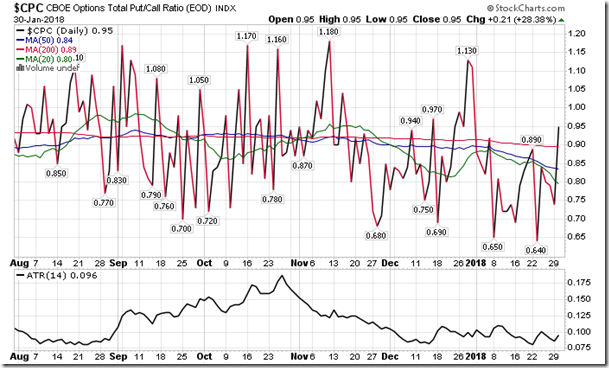 From a historical probability perspective, there is a very slight positive tendency to stocks in the day and week following the President’s State of the Union address, as well as a positive tendency for the start of February. 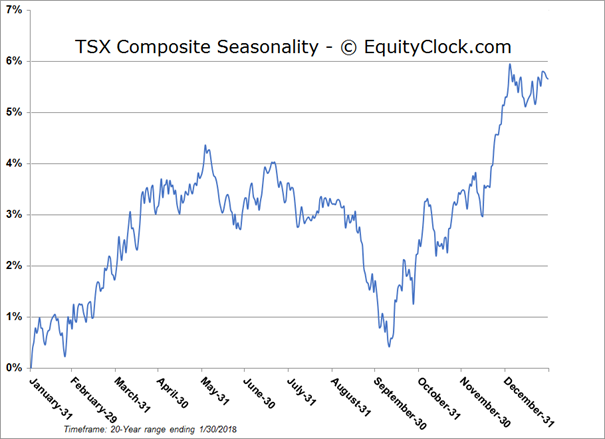 However, beyond this short term blip, the month of February tends to be the weakest of the best six months of the year, averaging a mere 0.2% gain over the period. On the economic front, Case-Shiller released their monthly look at home prices in the US. 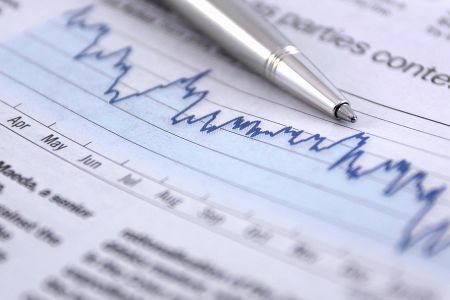 The headline print indicated that the 20-city aggregate index increased by 0.7% in November, edging out the consensus estimate which called for a 0.6% rise. Stripping out the seasonal adjustments, home prices actually increased by 0.2%, a positive divergence compared to the 0.3% decline that is average for the second to last month of the year. 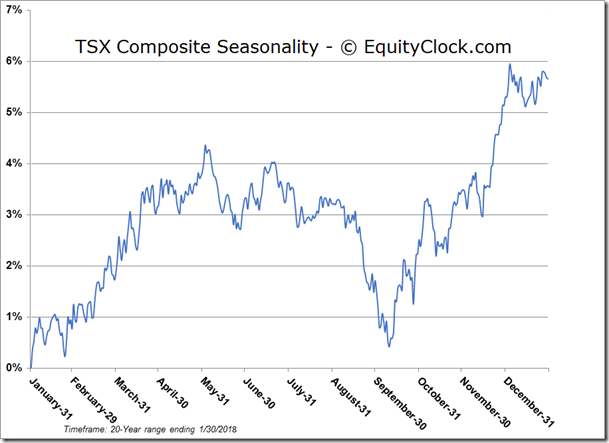 The gain for the month put the year-to-date increase at 6.2%, 2.1% above the seasonal norm and the best performance through November since 2013. Gains in some of the already highly valued markets, such as New York, San Francisco, and Los Angeles, helped to fuel November’s above average result. 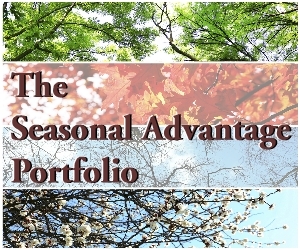 The fourth quarter of the year typically sees a decline in prices following the highs recorded in the summer, but this has yet to become apparent as the value of the largest asset of most Americans continues to be supported by favourable demand fundamentals. But while home owners are seeing a benefit, first time home buyers are increasingly feeling the pinch as affordability becomes out of reach. The prospect of rising mortgage rates is also a burden, pressuring the budgets of these buyers as they seek to finance this large purchase. Housing statistics have typically provided a leading indicator to periods of economic strain, but few, if any, warnings are being provided by this dataset. 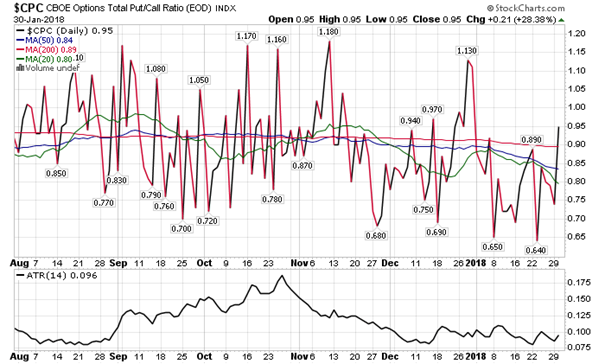 Sentiment on Tuesday, as gauged by the put-call ratio, ended bullish at 0.95.